For those of you who have been following these Chinese language posts, the 菜 character (grass-claw-tree) ought to be leaping out at you from the covers of the three cookery books pictured above. You may also be able to guess, from the context, that the titles of the books refer to some type of cuisine. There are three more cookery books pictured above, each displaying 家常菜 in very different fonts. The middle book-cover also has an attempt at an English translation for the Chinese characters, but it is rather unfortunate that the translator did not appreciate that, in English, the word ‘homely’ generally means unattractive or ugly. Clearly, the meaning that the publisher intended to convey was ‘homey’ and, indeed, 家常菜 can loosely be translated as ‘Home-style Cuisine’, ‘Home-cooked Dishes’ or, simply, ‘Home cooking’. The 家 character, as you can see, breaks down into two vertically arranged components. Both of these components are of a particular type known as ‘radicals’. This is a very important concept that we will be looking at a couple of weeks hence, but for now, all you need to know is that they are respectively known formally as the ‘roof’ radical and the ‘pig’ radical. In any event, a roof over a pig has come to mean ‘home’ or ‘family’ and one can only imagine that there must be an interesting etymological history behind that. You should also know that the character also has the further, secondary meaning of ‘house’ but this is the case only in limited instances. …It is not possible to say which of the various meanings of 常 are in play here … When characters form compounds, the collective meaning may be related to, or entirely independent of the separate meanings of the constituent characters. In non-culinary contexts, 家常 can mean ‘every day family life’, or otherwise convey ‘hominess’, but when it appears on cookery book covers, restaurant signs, or menus, it is best translated as ‘Home-style’. 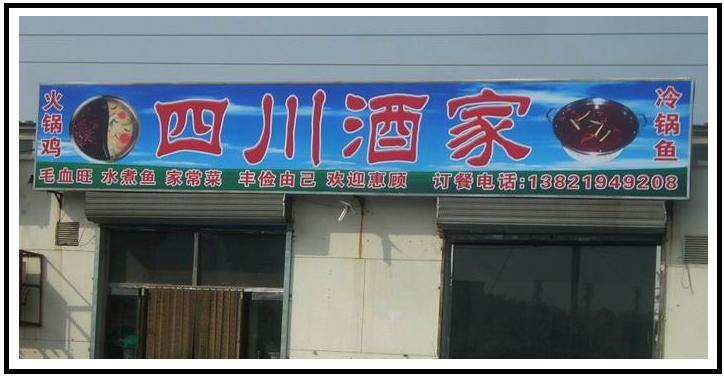 Home-style cuisine (家常菜) is frequently seen advertised on Restaurant Signs. In the first, and possibly the second of the pictures above, it looks very much as if each restaurant is actually called 家常菜. In the third picture, the sign appears to be an auxiliary rather than the main sign for a restaurant. One rather imagines that if it were on a western restaurant it would probably say something like ‘Home Cookin’’. Here are another couple of examples. In the picture on the left, the character following 家常菜 is basically one of the ways of indicating that the establishment is a restaurant. It’s a bit of a non-standard way of doing it but don’t worry about that for now. On the right, you should be able to find two instances of our three characters together. In the above two examples, the fonts are rather tricky. Still, if you have been following these posts regularly, you should be finding that the 菜 character is starting to ‘leap out’ at you. By the way, it is not easy to see, but if you look closely at the picture on the left you may just be able to make out another character we looked at recently. On restaurant signs, 家常 is commonly followed by 菜, but this is not always so in other situations. On menus and in recipe books, for instance, you may see the two characters included as part of the name of a given dish to indicate its supposedly rustic or ‘homey’ nature. There are two different dished pictured above… On the left is a ‘Home-style’ lamb preparation and, on the right, squid is being given the ‘home cookin’’ treatment. In both cases, the character immediately following the 家常 further specifies the actual cooking method. Once you see enough instances of this sort of descriptive name you will probably conclude, as I have, that 家常 is to Chinese cookery what ‘Home-style’ is to western cuisine… it basically means whatever the hell the cook wants it to mean. Oh …. in the picture on the left, the main ingredients are listed below the name.. You should recognize one of them easily! I am closing out today’s post with another picture of a restaurant sign. If you squint at the smaller characters, you should be able to tell that the place does indeed serve 家常菜. However, you may be a little puzzled by the appearance of 家 in the larger characters forming the restaurant name… Here, it is not followed by 常… what gives? You are a very good teacher – this ‘course’ is building up in a very interesting way tho’ this needs a bit of quiet evening time after work 🙂 ! Good job, John. To me 家is home. 常is always. 家常 菜 ，means home cooking is always good!.